After a relatively short train ride to Florence from Venice, I made my way to the Firenze airport to meet up with the Minerva Education group. The owners, Piero and Casja Baldini, both teach (in Piero’s case, taught, as he recently retired) at Arizona State University in Phoenix. Piero grew up in Florence, and he and Casja, Swedish by birth, spend their summers in Italy. For the last couple of years they have also hosted writing retreats in Chianti. Altogether, there were six writers, all American, and from all over the country: me from Ohio; Teresa from Florida; Kathy from Washington, DC; Bobbi from Michigan; Cheryl from California; and Stephanie from Tennessee. The writer in residence, Rhys Bowen, lives part of the time near Phoenix, and part of the time in California. She was accompanied by her husband John Quin-Harkin. Both British ex-pats, they are also world travelers, multi-linguistic, and just flat-out interesting people. We stayed in the beautiful Hotel Salivolpi in Castellina in Chianti, in the Tuscan countryside. The photos below were taken on the porch of the house four of us stayed in. 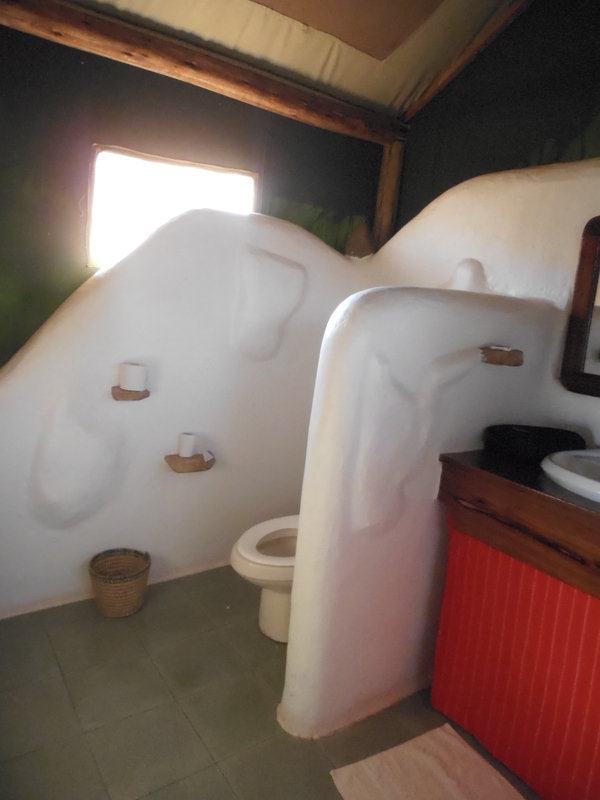 We each had our own rooms with en suite baths, including bidets. We would meet several times a day: breakfast in the hotel’s breakfast room, then a morning session with Rhys. She would give us an hour or so on a specific topic, then after a brief discussion she gave us an assignment to work on during the day. We’d each go our separate (sometimes together) ways, then meet again at lunch in the breakfast room, which we had to ourselves. After our always-delicious lunch we would again separate, usually each of us to work on the day’s task, which we would discuss in late afternoon with Rhys. We took turns reading what we’d written, hearing thoughtful comments from Rhys, and each sharing our own thoughts or ideas about one another’s projects. Then it was time to freshen up and take a short walk together to a nearby restaurant, Il Fondaccio dai Dottori, for a long, leisurely dinner. The town of Castellina in Chianti was a slightly longer walk from the hotel, a bit over a half mile, along a one-way roadway. Most days, we strolled into town for a wine tasting, or shopping, or to have laundry done.Castellina in Chianti is midway between Siena and Firenze (Florence, y’all), which explains the strange sculpture pictured at the top of this post. One of the women faces each of the two towns, which engaged in bitter rivalry for centuries. One Sunday we all trooped into town for Mass at the church of San Salvatore. It happened to be the Feast of the Corpus Christi, and Rhys, who speaks Italian, noticed there would be a procession that evening. We all decided to go back into town for the procession. When we got there, we found that a wedding was just ending. The bride and groom, we later found, were both of East Indian descent, both Londoners, and they had driven to Italy for the wedding, along with many guests, many wearing exquisite saris. The procession took place after all the wedding party and guests vacated the tiny area in front of the church, and after the baldachin was lofted over the village priest (the same one who’d said Mass that morning), holding the Eucharist in a golden monstrance before him. Lined up in the procession were the band, playing a slow, sorrowful march, then the baldachin, or canopy (Corpus Christi is the only holy day which uses this), then the women of the church, then the children who made their First Holy Communion that morning, and then the men of the town. The procession made its way down the street about three blocks, turned around, and came back. Castellina in Chianti is famous for its wine, and for its olive oils. We tasted several types of each, and several in our group had wines and some of the wonderful balsamic vinegars sent home to the US. It’s also a region rich in history, dating back to the 6th and 7th century BC, with evidence of Etruscan habitation. We visited the mysterious Montecalvario Mound, high on a hillside, with fascinating tombs. A curious feature of the town is the underground tunnel, in the bottom right photo below. Shops and restaurants line this area on one side; the other side offers views of the hills below. The black rooster is the symbol of the Chianti Classico, the most famous wine of this region. One day we all piled into a bus for a daylong tour of Siena. Except for Rhys, who took the opportunity for some much-needed downtime, a little laundry, and some sketching of the area. The rest of us enjoyed a day of touring the beautiful San Domenico, which contains the Cappella di Santa Caterina, where the incorrupted head of St. Catherine of Siena, Italy’s patron saint, rests in splendor. (Yes, creepy, but sacred to millions of Catholics.) We also toured the exquisitely beautiful Siena Duomo, which I’d seen before. However, the guide we had this time was a million times better, and we also were able to see inside the jewelbox that is the Libreria Piccolomini, a library that was commissioned by Cardinal Piccolomini in honor of his uncle who would become Pope Pius II. The Cardinal himself would eventually become Pope Pius III. The cathedral is worth the trip to Siena, all by itself, even though the city is so amazing. Because it’s one of the many Tuscan “hill towns”, very much of the city is vertical. Streets are steep, and usually narrow. I got a big kick out of the tables outside many of the restaurants, with legs shortened on one side to accommodate the steepness of the street. We had a glorious day in Siena, except for just a few moments while we were eating lunch outside under the grape arbor. A hard rain pelted down on us, forcing us to move under a tent, but that didn’t dim our enthusiasm for the food and wine. The local specialty is pici pasta (pronounced “peachy”), which several of us tried as pici cacio e pepe: Pici with pepper. It’s a very simple dish, with the hand-rolled pici pasta, olive oil, plenty of grated pecorino tuscano cheese, and tons of freshly ground pepper. Magnifico! The restaurant, All’ Orto de’ Pecci, is basically a garden, in a very beautiful spot just outside the center of town. They have peacocks strutting around, donkeys, and other animals, including a herd of enormously horned sheep. 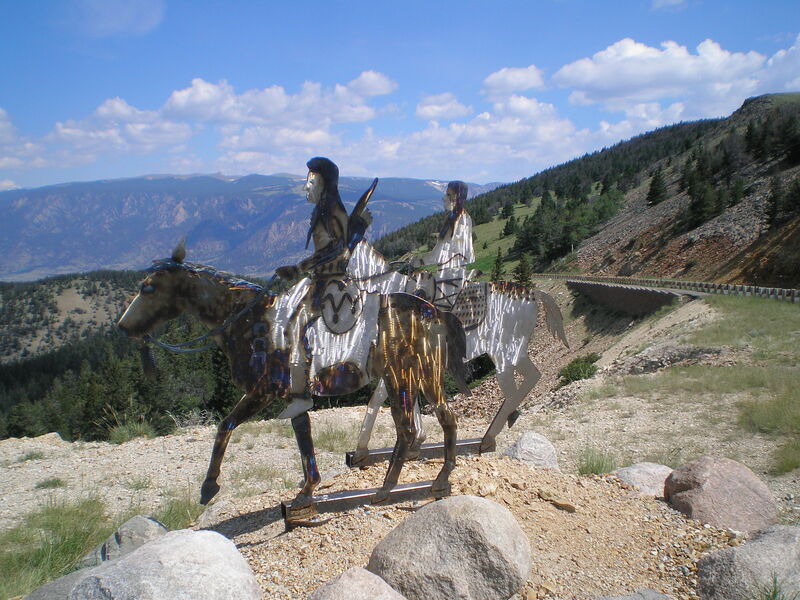 The big metal sculpture in the photo below, top right, is an empty head, entitled “Open Mind”. It was easily large enough to step inside and peer out. On our last night at the workshop, the Baldinis took us into town (in a pouring, chilly rain, so it wasn’t quite comfortable to walk) to the Rosticceria Il Re Gallo, where we had another excellent meal. Most of the time we ate family style, and that evening was no exception. We all enjoyed trying little tastes of various new dishes, and discovered many favorites this way. We had such a lovely evening together, friends after being together for nearly a week and a half, and sharing so many experiences. As for the writing part of the retreat, I learned many things, including that my style is uniquely mine. Each of us had such different “voices”; it was fascinating to hear the difference, as well as to see how each of us progressed every day. I saw many light bulbs switch on, and had some switched on for myself, as well. I look forward to reading the books that will no doubt come from this workshop. However, I still had another nine days of traveling after I left this group, all of it on my own. I was about to embark on my biggest adventure, ever: solo travel in countries where I did not speak the language, and barely knew anyone who lived there. In fact, I knew a single person in one of the next three countries to which I’d travel. That was more than a little worrying. First, though, I spent a night in Florence. Bobbi, one of the other workshop participants, was also spending some time there before she went back to the States, and we agreed to attend the opera together. Bobbi knew about the opera performances at St. Mark’s English Church, and she arranged tickets for us the night we were there. We decided to have a bite of dinner together first, so we stopped into a bistro not far from St. Mark’s. The waiter, who was used to people coming in before the opera, arranged to serve us quickly, beginning with a spritz for each of us. The people at the next table were also Americans, a couple who won a fabulous trip and were in Italy for the first time. They were adorable, and took this photo of Bobbi and me, toasting with our spritzes. The opera was La Traviata, which I’d never heard before, and neither had Bobbi. The church is exquisite, and as an opera venue, very intimate, with great acoustics. Almost too good. We sat in the third row, mere yards from the actors, and when the soprano hit the high notes I actually had to plug my ears it reverberated so. I finally wadded up some tissue to muffle the sound to a manageable level, and then I could enjoy it. La Traviata is a comic opera, and very entertaining, especially so because of the emcee, who was hilarious. Strange, but true: we had assigned seats at the opera, and our names were on placards placed on our seats. Next to Bobbi a woman sat down and they started chatting. She turned out to have been a London-based guest at the wedding we saw in Castellina in Chianti! Since the wedding she had been traveling in Italy. Florence is always beautiful, but on this brief visit I didn’t have enough time to do more than wander the streets and get a little lost–one of my favorite things to do while traveling. Gypsy beggars were everywhere. I confess to being shocked by how many. The strangest sight was of the woman lying in the street with her head touching the sidewalk. I was to see her clone many times on this trip. My travel agent had arranged for me to stay just a block from the train station, which was a blessing. It made getting there for my train to Bologna very easy. From Bologna I would switch trains to the Brennero, and travel through the Brenner Pass in the Alps, a longtime goal of mine. My maiden name is Brenner, and I’ve been curious about that area ever since I watched the movie “Heidi” as a child. August 20, 2016. Uncategorized. Leave a comment. In December 2015 I heard about a wonderful, nine-day writing workshop in Italy, taught by one of my favorite authors, the prolific and ever-entertaining Rhys Bowen. Rhys writes three mystery series, and she would be the author in residence at a charming hotel in Tuscany, Castellina in Chianti, to be precise. A small number of students meant lots of personalized attention from Rhys, and all meals were to be provided for the nine days. I’ve written several books and booklets, many magazine and newsletter articles, and lots of blog entries. And I’ve edited whole books, including some mysteries. But I’ve never written fiction, let alone a mystery, and I’ve always wanted to. So I took the plunge, and made the commitment. Steve had work plans already for that time period, so I decided to make another leap into the unknown while I was at it: solo travel in Europe, a longtime goal. I’m 64 years old, and in pretty good physical shape; when would be a better time to travel on my own than now? We don’t know, do we, when our health will change? 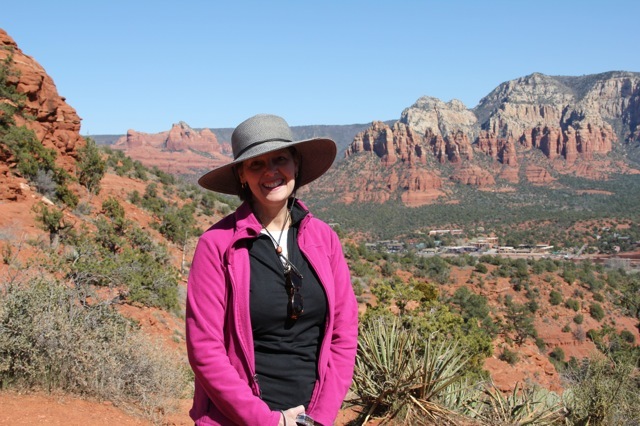 After a session with a travel agent, I chose to add additional travel plans before and after the workshop schedule. My daughter Holly and I have long wanted to go to Italy together, and she asked to take some vacation time for the few days ahead of the workshop so she could join me. We chose to go to Venice, which would be an easy travel distance to Florence, which is where I would meet the workshop organizers. Since I would be in Europe for three weeks, and since I would be traveling mostly by train, it was important to pack very carefully. I’d need a light suitcase I could put in an overhead compartment by myself. And I would need a tote that could hold my computer, plus my cross-body shoulder bag, so I could avoid checking luggage on the way there and back. I found a small, lightweight suitcase with the right compartments, but decided to make a tote that had what I needed. Once I curated the wardrobe carefully, making sure everything fit, I felt more confident about the solo aspect of the trip. On the advice of my travel agent, Vicky Mary of Victoria Travel here in Cincinnati, Holly and I stayed on Lido, an island across the lagoon from Piazza San Marco. The hotel was very nice, but not as pricey as it would have been in Venice itself. Lido is very walkable, with lush gardens everywhere, and our hotel was just a couple of blocks from where the vaporetto docked (and about four blocks from the Adriatic). We could not easily go back to the room with this arrangement, but in this case it didn’t matter. We had tours scheduled, and we just kept ourselves busy every day until it was time to go back for dinner on Lido. The sunsets were worth the trip, too. We wouldn’t have seen this view from Venice! Our first tour took us through the church of San Marco and the nearby Palazzo Ducale, or Doge’s Palace. We had a very good guide who spoke good English, and our group was fairly large. We each had a “whisper” with headphones, though, so everyone could hear her commentary. The tour was a good way to get ourselves going on our first day; we had to meet the guide early in the morning, and then we walked for several hours. It rained in the morning, but we were inside for most of that time so it didn’t matter. The church and palace are both incredibly ornate and showy. We started out taking photos of everything, but after room upon room of incredibly beautiful paintings and gilt, it became almost overwhelming. We crossed the Bridge of Sighs both ways; it has two levels where prisoners were shunted from one building to the other over a canal. The next day we had a different walking tour, a “Secret Venice” tour. Our guide was livelier, the group was smaller, and we saw the alleys of Venice. We learned about daily life, and saw the shops where the gondolas and the parts that go into them are made today. The guide, who grew up in Venice, told us that modern gondoliers no longer inherit their boats or their trade, nor do they sing as they once did (although some sing because they enjoy it). Today, guides must go to school—to learn all about boats and boating, culture, history, and at least two languages in addition to Italian. In order to become a gondolier they have to pass a test, and then must obey many rules about dress and comportment. So far in Venice there is only one female gondolier. We enjoyed walking around this lovely city on our own, too, finding our way down little passages, crossing bridges to discover hidden gardens, tiny courtyards, fruit and fish markets, and fountains with drinking water for the taking. Our favorite discovery was the spritz, a potent orange drink made from prosecco, Aperol, and soda water. It’s a traditional afternoon sip, usually served with something to nibble on, since it has such a high alcohol content. Tourists and locals alike can be seen sitting in outdoor cafes having this delicious cocktail.One of our waiters also gave us a recipe for his restaurant’s amazing tiramisu. I look forward to trying it out, because the recipe I’ve used before never worked out right. Venice was packed with people in places, but it’s possible to find quiet walkways along canals or in sheltered campos. A campo was once a field, where they grew grass for the horses. There is precious little grass, or any other vegetation, in Venice today, since many of the campos were covered over in cobbles, long ago. One modern-day phenomenon struck me about Venice. It is a city with no cars, or any vehicles other than handcarts. Ambulances and police boats travel solely by water. There are lots of different kinds of boats, though: the vaporetto, which serves the same function as a bus anywhere else; water taxis; gondolas, of course; and private boats. The gondolas have the right of way. Tourists with selfie sticks are everywhere, including on the water taxis in the Canal. I asked our gondolier how many tens of thousands of cell phones end up in the lagoon, and he said, “Many, many.” I can believe it. On the fourth day, I was pretty much over any lingering jet lag, and it was time to meet up with the workshop group in Florence. I said goodbye to my daughter, who was flying home to the States, and I boarded the vaporetto from Lido one last time to catch a train to Firenze. June 28, 2016. Uncategorized. 1 comment. 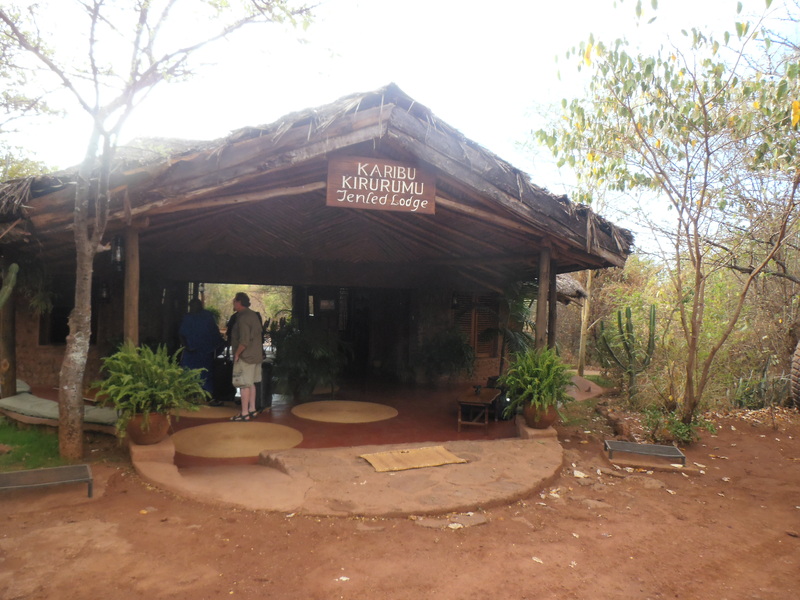 On our way to the Tarangire National Park we first stopped at a carving shop down the mountain from Gibb’s Farm. Several men were sitting outside the shop, carving freehand from pieces of ebony and rosewood. Terry bought some bigger pieces, but I had to limit myself to a small but elegant little carving of an embracing couple, a little bowl, a hippo for my grandson, and a necklace. Kim found one, as well. There were relatively few places to buy souvenirs on this trip. On our way out of Arusha, on the third day, we could have stopped to look at tanzanite, but I wasn’t feeling well that day. I was the only one in the car who was interested, and I didn’t care that particular moment whether I shopped or not, so we passed it up. We did, however, stop at a boma, or Maasai village, where we inspected one of their huts, and were treated to a dance performance. Kim and I were also pressed into participating in the dance, but Terry and Steve are forbidden from ever sharing photos or video of the experience. At the end of the dance we were invited to inspect a vast variety of beaded jewelry and other items for sale. I thought they were grossly overpriced, myself. Tarangire is a spectacular park, home to hundreds of elephants, as well as other wildlife, concentrated because of the availability of water. On our one full day at the park we saw close to 300 elephants, between the ones we saw in the forest and the vast herds in the marshes. We also saw a lazy pride of young lions, snoozing in the shade of a sausage tree. They were completely unconcerned about us, despite our Land Rover driving all the way around the tree, in the same shade. On our first night at our new camp we were treated to a traditional camp dinner, with amazing food, under the stars. 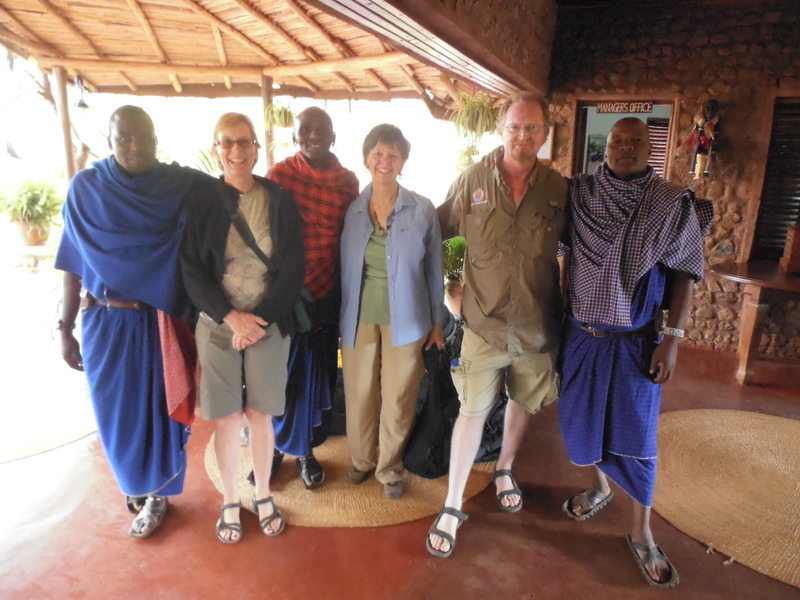 The owner of Flash Safari Tours, Magda Vrijs, joined us and several other groups traveling with her guides. Our camp was so interesting. There were about a dozen cabins, all different, and all given Maasai names. Ours was Olmeut, which means “giraffe” in Maasai, as opposed to the Swahili name for giraffe, which is twiga. The beds were carved, as were our chairs, the mirror frame, and the enormous bathtub, which was in the shape of a pelican. Steve and I were sitting on the porch between our shower and dinner, and suddenly a dik-dik and then a warthog thundered past. We were sure something bigger would follow in hot pursuit, but nothing ever appeared. In the 12 days we traveled around Tanzania we saw nearly 240 different species of birds, and several dozen species of animals. Zepha, our guide, was exceptionally good at spotting birds and animals, and he had an almost encyclopedic knowledge of the natural history of his native country. The day we saw these elephants, though, was one of my favorite days of the entire trip. We watched them for hours, and we got very near to several different groups during that day. In fact, the dust from one elephant taking a dust bath actually blew into my eyes, we were so close. We were fascinated as they lumbered into the mud, then the water up to the tops of their heads, then out into the dust. The termite mounds we saw everywhere were almost all shiny from elephants using them as scratching posts, to get that itch, just there, the one you can’t reach. The last day of our trip was a travel day, with a long drive back to Arusha. We stopped at a restaurant for a cold drink, and later met Magda and her partner at a traditional Tanzanian barbecue restaurant for a late lunch. We sat outside and watched local families, some celebrating weddings or other events, and we relaxed on our last day in Africa. After our server helped each of us wash with warm water and towels, we ate with our hands from platters of barbecued meats (including chicken and goat, all delicious), and fried potatoes. The local beer might be great, but I wanted something different, and Magda suggested a Tangawizi, a locally made ginger beer. A new favorite! What a trip. We thoroughly enjoyed everything, except maybe the tsetse flies. We even got used to the dust. It took days to stop seeing the golden plains in my dreams, and I was sad to see them fade away. Asante sana, Tanzania! We will never forget our visit with you and your many treasures. June 28, 2016. Uncategorized. Leave a comment. June 24, 2016. Uncategorized. Leave a comment. The second day of our trip ended with me starting to feel crummy, with the same thing Terry had a day before, and the beginning of the third day was a travel day through Maasailand. We passed bomas, the fenced-in villages of the Maasai, and went through one especially colorful town that was having a market day. 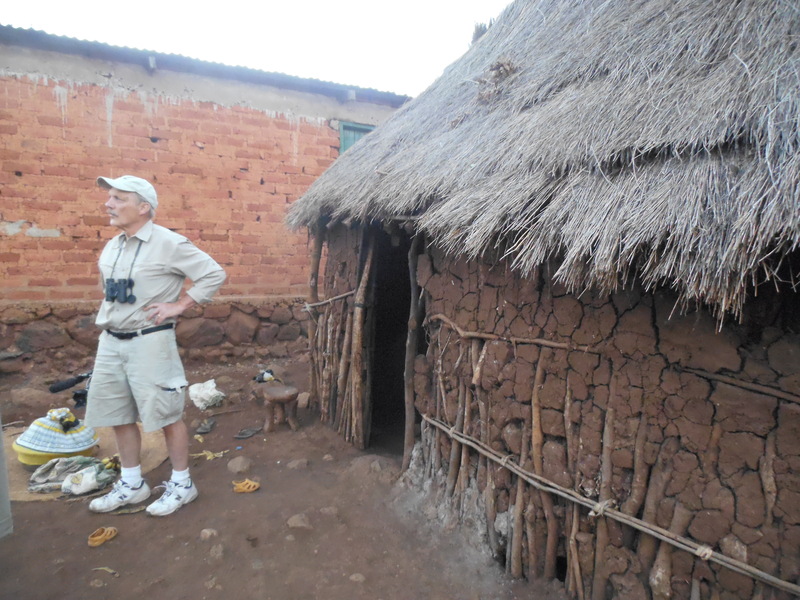 (On the way back we stopped at a boma, and I’ll have a story about that, plus photos.) By the time we got to Kirirumu Tented Lodge, I was so grateful for a bed to lie down on that I waved the others away for an afternoon of driving through Lake Manyara National Park while I slept. Our tent in Kirirumu Manyara Lodge. This camp has what is called permanent tents; ours had a concrete floor, raised from the ground, but with tented walls and ceiling. Every tent we stayed in was enormous, had real beds with nice linens and cozy blankets, and every single one had full, working bathrooms with running water, including hot water. We were instructed to zip the doors completely, and to stay in our tents at night unless escorted by the guards, in this case Maasai warriors. At this point, I didn’t care about anything except having a bottle of water, a cover to pull over my fevered body, and a nearby washroom. I slept most of the afternoon, too dizzy to stand, while the others saw lions in trees, elephants, and loads of other wonderful things. By the time they got back to the lodge I was feeling better, and it was time for a shower. 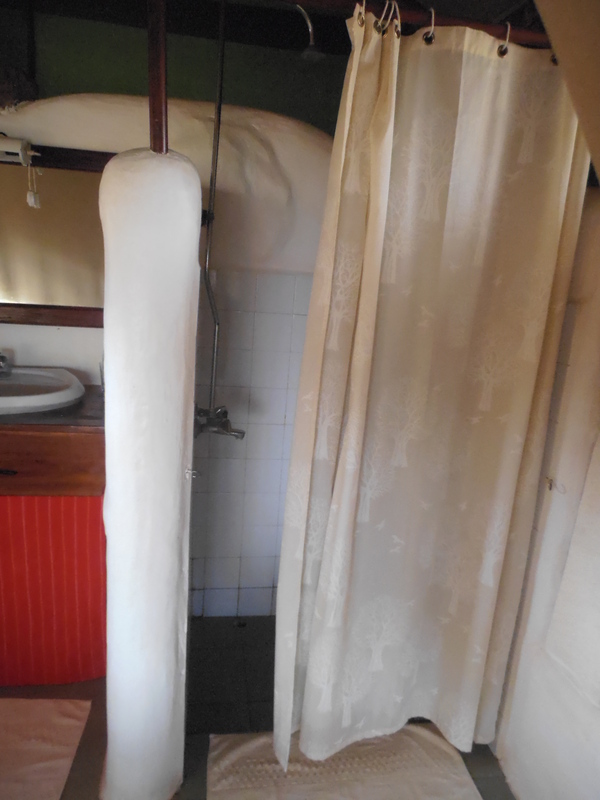 Behind the tent flap: a full bathroom inside the tent. This is the shower, next to the vanity. The toilet was on the other side of the vanity. The other half of the bathroom. A note on showers: at every initial arrival to the various lodges, farms and camps we were greeted with glasses of fresh juice and moist, sometimes hot, towels with which to wash our faces and hands. The roads are so dusty, and it was shocking how dirty we were every night, just from sitting in the vehicle all day long. We really learned to appreciate the welcoming hot shower at the end of every travel day, with a cocktail hour afterwards. Dinner was always a leisurely event, beginning with a delicious soup, then the main course, and the inevitable dessert. Alcoholic drinks were not included in our tour package, but they were usually inexpensive, compared to American prices. Since this part of Africa is so close to the equator the day begins at around 6:15 AM and ends exactly 12 hours later, 365 days a year. Zepha, our guide, told me “Swahili time” begins at daybreak, which corresponds to our midnight. So 7:15 AM is 1 o’clock to those who still keep track this way. 4:15 AM would be 22 o’clock, if I understood correctly. 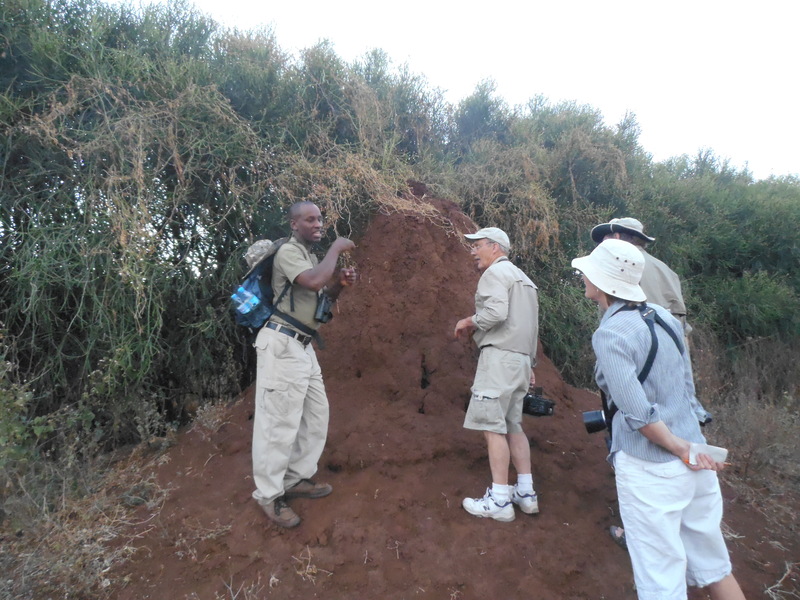 Zepha explaining the fine points of the construction of a termite mound. Zepha taught us a few Swahili phrases to use during the trip, but I’m afraid we were mostly bad students. I did write down some of them, though: Hakuna matata, of course, meaning “no worries”. Asante sana, one of the most often used phrases in this very polite country: “thank you very much”. One of our group favorites was one that Zepha used frequently: Haraka haraka, Haiana baraka, meaning “hurry, hurry; no blessing”, or “haste makes waste”, as we would say it. Poli poli means “slowly”, which we saw a few times on signs exhorting drivers not to speed. My personal favorites took a bit longer to learn: lala salama, “sleep well”, and harabi se asobuyi, “good morning”. In the photo of the Kirirumu reception area above you’ll notice “Karibu”. That means “welcome”, as well as “you’re welcome”, and we heard and said that one a lot during the course of the trip. 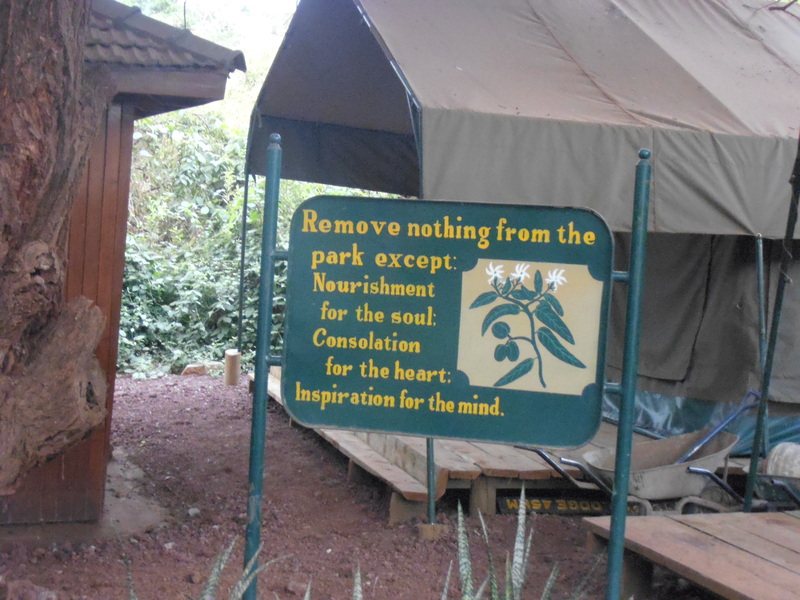 At the entrance to Lake Manyara National Park. 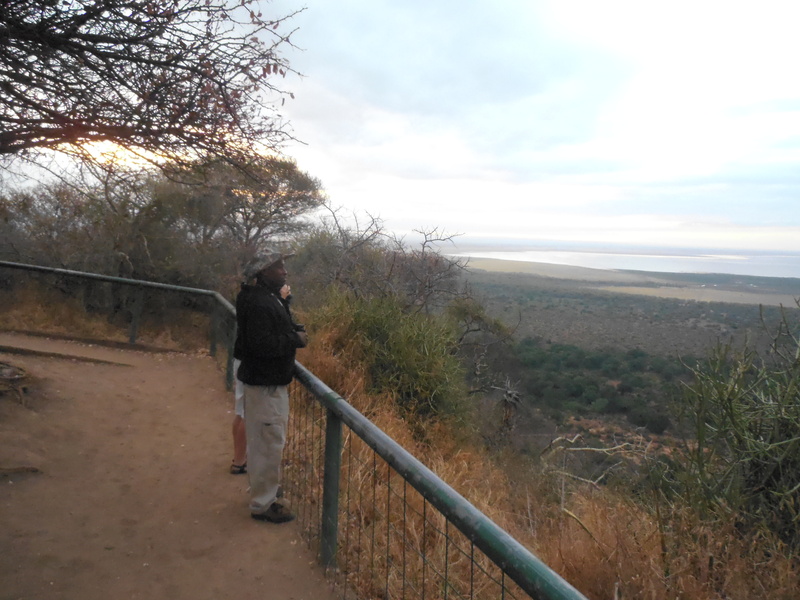 On an overlook, checking out Lake Manyara. 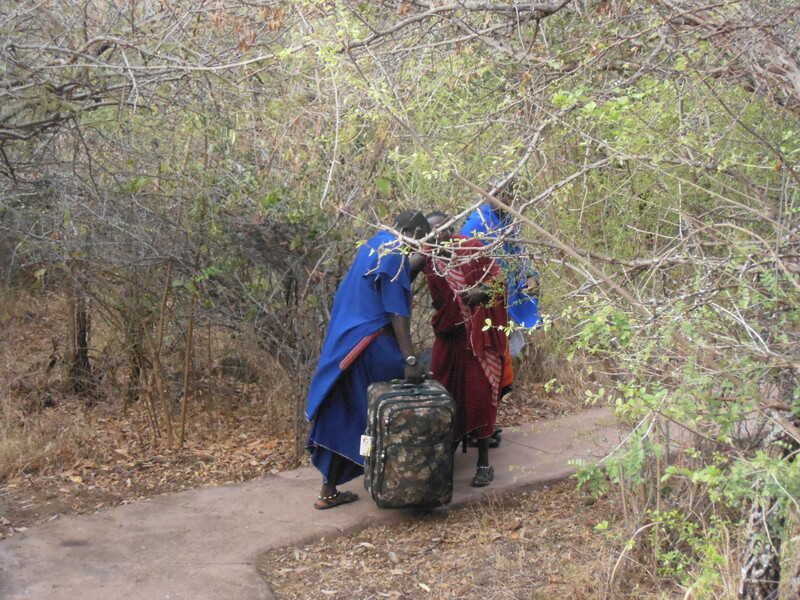 Feeling a bit better the next day, I was ready to go to Lake Manyara with the group. 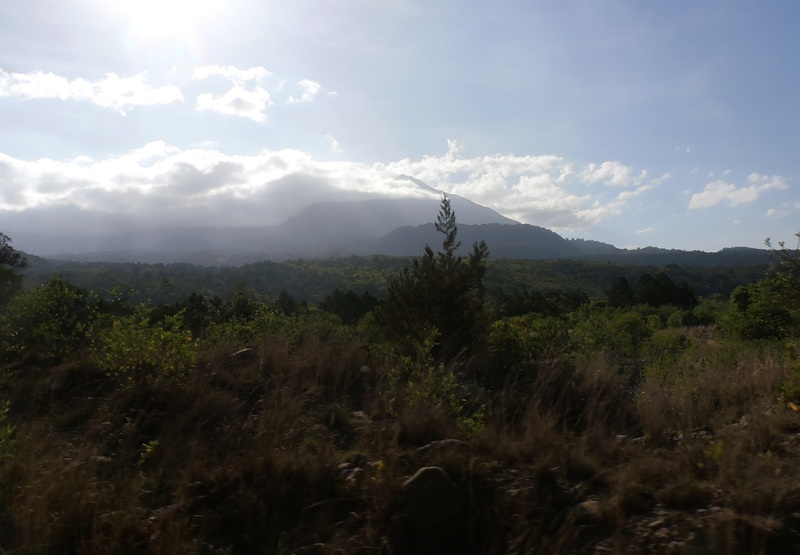 We got there very early, hoping to spot wildlife before others frightened them into the bush, or before it got too hot. Zepha kept looking out the window at the dirt road, and I finally realized he was looking for elephant tracks. 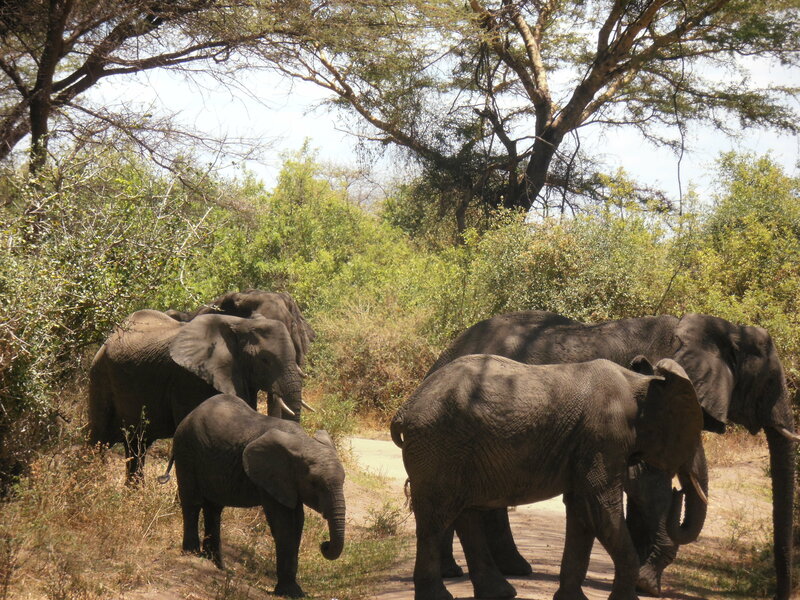 We eventually found a fairly large herd of them, and while our vehicle was stopped they surrounded us. It was one of those breathtaking moments, just one of many we had on the trip, but I’ll never forget the first time we found ourselves among the herd. I missed the tiny baby elephant that was there when we first spotted this group. Zepha thought it could not be more than three or four days old, but Kim, who had a better viewing angle than I did, was thrilled to see it. The adults surrounded it very quickly, though, and ushered it safely out of our sight within just a minute or so. As long as we were quiet, and stayed inside the safari vehicle (which was required, for most places we went), the animals did not feel threatened and so we were safe. 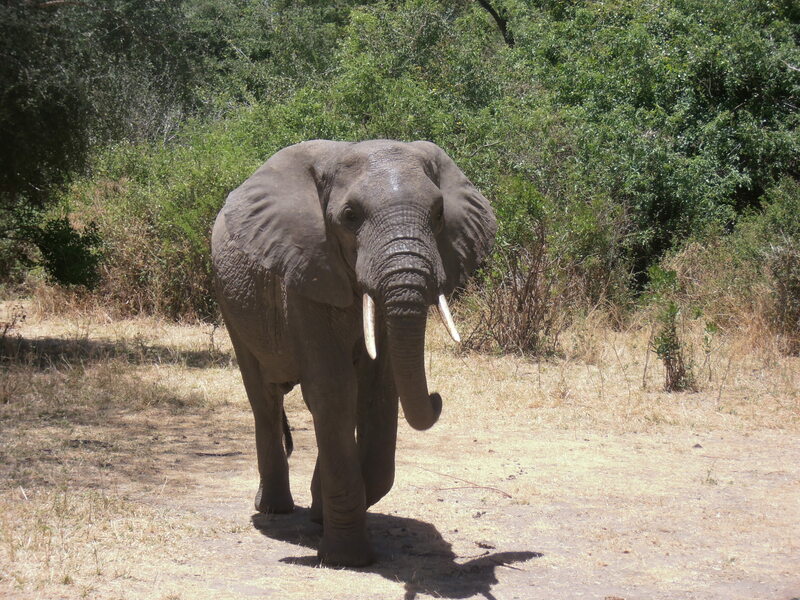 One elephant decided to make sure we stayed put, and trumpeted at us, which was pretty thrilling. They crossed in front of our vehicle to a dandy place to mud bathe on the other side of the road. Definitely a “hakuna matata” moment. 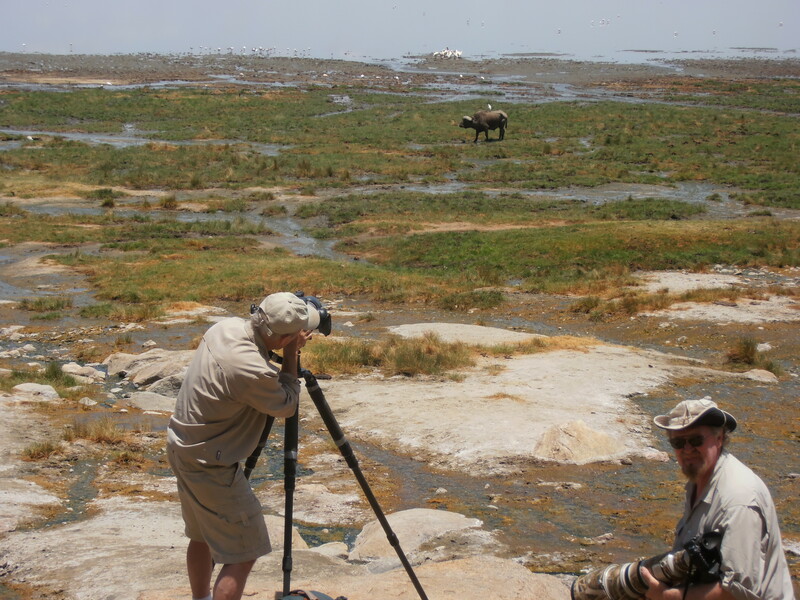 At this park the big feature is Lake Manyara, a magnificent alkaline lake that covers many square miles (about 77 at peak depth) and is host to a variety of bird life. We went to the far side of the park, to an area where hot springs flow into the lake. Many animals come here to feed and to drink, and we saw Cape buffaloes, zebra, striped mongoose, ostrich, and lots of shorebirds. Steve and Terry had a ball taking photos here, with no real barriers to the animals, one of the few times they were able to photograph outside the safari vehicle. We returned to Kirirumu early enough that we could take a birding walk with Zepha. The staff at this lodge is very friendly, and since they live close by, part of our walk passed some of their family homes. 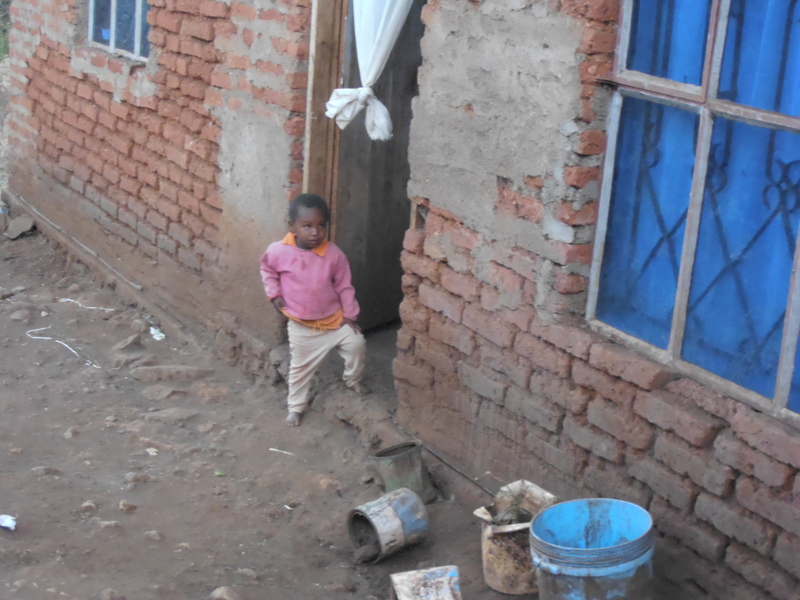 One young woman invited us to visit her home, so we accepted the invitation. Rebecca’s husband is a waiter at the lodge, and they have two small children. 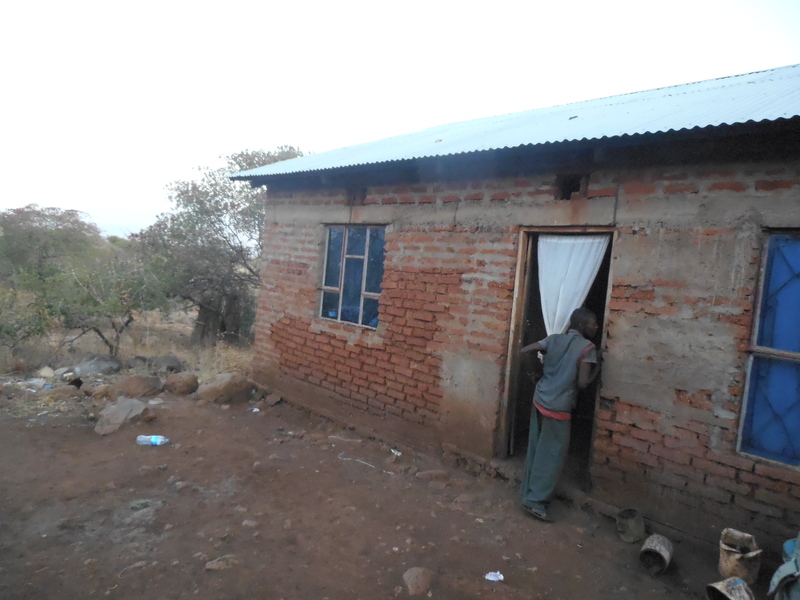 Their house is an ongoing project, added to as finances allow, but a fine addition to the village. It is made of bricks manufactured locally, and has a dirt floor and flap doors, but very clean. Rebecca offered us two treats while we were there: tiny, sweet bananas, and chunks of sugarcane to chew. The peels and sugarcane debris were tossed to the floor, to be cleared afterwards. We sat on comfortable couches and upholstered chairs, and a couple of neighbors came in to see what the heck was going on. At dinner later Rebecca’s husband was speechless to learn we’d visited his home. I got the idea that most tourists didn’t visit that part of the area, not even for birdwatching. Steve, standing outside Rebecca’s kitchen, which is separate from the house. Neighbor, checking out the goings on. Staff at every lodge hefted our luggage to our rooms for us, and hauled it back and onto the top of the safari vehicle when we left. Sometimes we ended up making great friends with staff, although I did not always get photos of them. At this lodge, Terry and the Maasai guards/porters ended up having way too much fun together, but it was tremendously entertaining. Maasai guards with Kim, Karen & Terry. Hauling my big bag down the path from our tent. The managers of the dining room at this lodge were especially fun, and we enjoyed our meals there. The food was great, but the staff made everything better. I’ve seen online reviews of Kirirumu that made it sound as though other places were preferable, but more on that in later posts. I definitely disagree. Our next destination: the great Serengeti, with lots of wildlife drama. Stay tuned. Typical dog seen wherever we went. 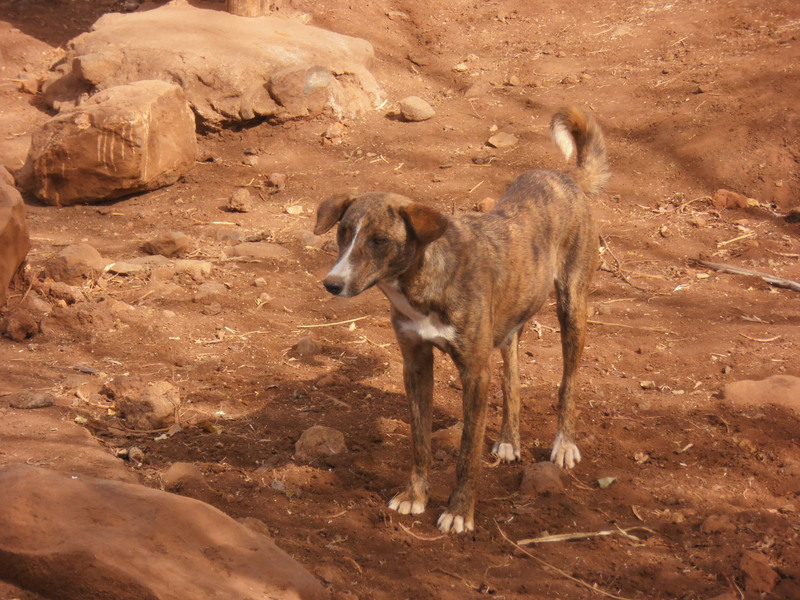 Probably a close relative to the Rhodesian ridgeback, a breed used to hunt lions. December 3, 2013. Uncategorized. Leave a comment. Well, I had big plans to tour the US in a self-contained vehicle, but then something kind of wonderful happened. My husband invited me to join him for a two-week trip to Northern Tanzania this October. Also, a perfect vehicle had appeared, but since the dealership sold it before I could get my financing together, I decided to let that sit for awhile and concentrate on preparing to travel to Africa. 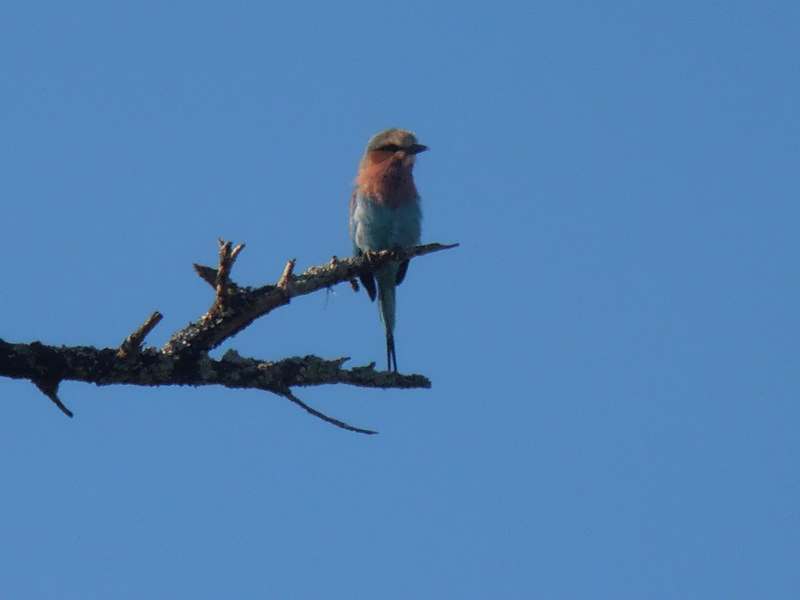 So we left on October 7th, and had a fabulous 12-day photo/wildlife/birdwatching safari. We joined friends from San Diego, the Petersons, and shared a guide who drove us all over six parks in Tanzania: Arusha National Park, Manyara National Park, Central Serengeti, Northern Serengeti, Ngorongoro Conservation Area, and Tarangire National Park. 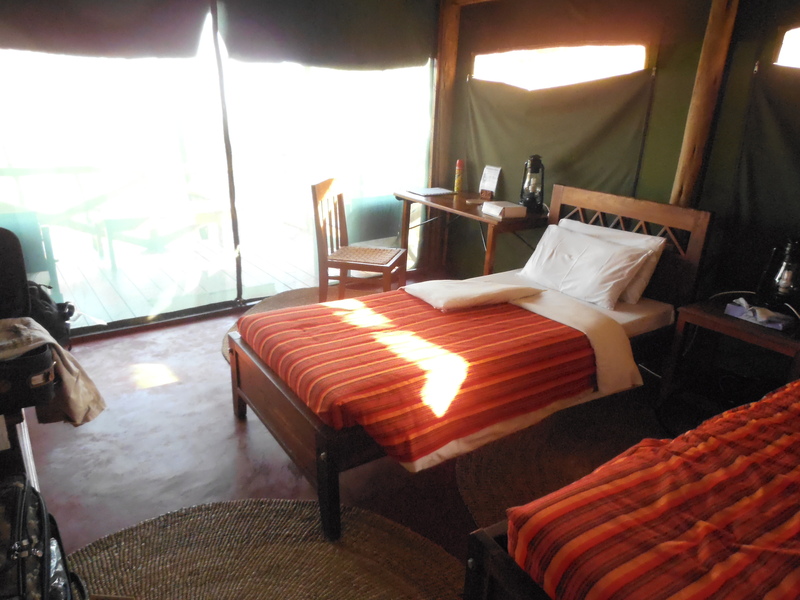 We spent two nights each in an assortment of lodges and tented camps, always with hot water, toilets in the rooms/tents, and with real beds, plus amazing food and service. I’ve never eaten so much or been cared for so well. Along the way we stopped at a Maasai boma and danced with the Maasai, saw a lion stalk and kill a zebra, watched lions mate (not especially exciting, FYI), and saw an unbelievable number of animals in the Great Migration. I’ll share photos soon, after I’ve caught up, and after I’ve sifted through nearly 850 photos. 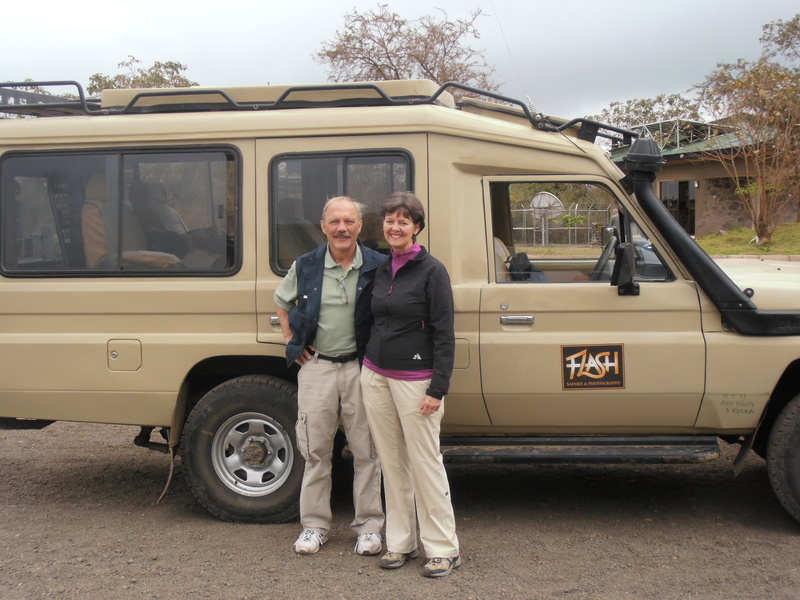 Steve and me, with our guide’s safari vehicle, where we had hours of “African massage” (road jolts) daily for 12 days. October 23, 2013. Uncategorized. 3 comments. That’s pretty much what I should have named this blog: Have Friends, Will Travel. Most of my family and friends know that I’m up for a road trip (or a plane trip) at the drop of a suitcase. That’s a good thing! Last month, my youngest daughter Holly invited me to join her in Washington, DC. She was attending her first professional conference on her own, and she had an extra bed in her hotel room. DC is an eight-hour drive from here, and I love our nation’s capitol. And I love my daughter! There is always a good reason to see both. The drive is not long, but it can be arduous, since the only way there is through mountains, no matter which route is chosen. At some times of the year the mountains can be treacherous, either from icy conditions, or from poor visibility from heavy snow or from fog. I got lucky this time. Even though it was February, temps were mild, and the snow on my way home, while steady, was light and the roads never got slick. Since Holly’s husband is in the military, and currently stationed in Afghanistan, she was able to book a room at the Navy Lodge, which is part of the Walter Reed National Military Medical Center complex in Bethesda. The Medical Center is situated along a main road opposite the campus of the National Institutes of Health, with a convenient and busy Metro station in between. The hospital is also known as the Bethesda Naval Hospital, and it’s where Presidents are generally treated medically during their time in office. Ronald Reagan was operated on there, and John F. Kennedy’s body was flown there for an autopsy after his assassination. Little known fact: Presidents pay for treatment out of their own pockets at this facility. Nancy Reagan had a mastectomy here, for the breast cancer discovered while she was First Lady. Needless to say, security is very tight at this complex. We were required to submit our drivers’ licenses and other information to use the facility, plus show ID to get back in when we left. The Walter Reed Medical Center is one of the largest medical complexes in the United States, covering more than 113 acres. The Navy Lodge here is only one of many that the US Navy operates, largely for families visiting military personnel being treated at the facility, or for military families in the process of moving to a new post. There are Navy Lodges operating in sixteen states in the US, and in three additional countries: Italy, Spain, and Japan. We heard many languages spoken in the lobby of the hotel, since military personnel from other countries are also treated here. A group of Georgian (formerly part of Russia) soldiers with amputated limbs were staying there while we were there. Before I left for DC I posted a request on Facebook, asking if any friends in that area would like to meet up while I was there. A longtime, online friend, Welmoed answered the call enthusiastically. Welmoed lives north of the city, and she picked me up at the Metro station near her home. Welmoed and I were both educators for a wonderful patterndrafting software company, Wild Ginger, but we had only seen one another in person a couple of times before. However, sewing folk like us, who have communicated online for around 15 years, always have something to talk about! We had debated going to a museum, but I wanted most to see Welmoed’s fabulous home, Redwall, which she has talked about in a forum we both frequent. Redwall sits on six acres smack in the middle of a suburb of McMansions, a holdout from the clutches of a developer. It’s a brick Arts & Crafts style home, with too many features to count, really. But how many homes do you see with a cloister? The one at Redwall provides shelter from the weather between the main house and the garage, plus Welmoed’s wonderful sewing studio. One other outstanding feature at Redwall: it’s guarded by a large metal sculpture, an actual, fire-breathing dragon. After the house tour, we drove to a local foodivore place for lunch, Founding Farmers. Too bad they don’t have locations outside the DC area; the food was fantastic–fresh, vibrant, and abundant. Neither of us could resist the basket of homemade potato chips, truly the best I’ve ever had. They also handmake fresh syrups for their drinks, which are also delicious. 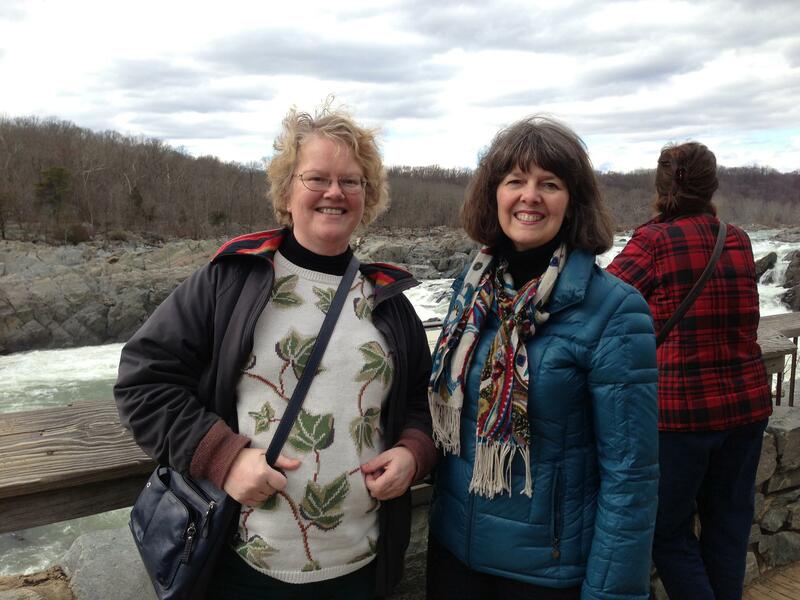 Both of us well-fed and ready to get a little exercise, Welmoed, a great tour director and host, then drove us to Great Falls National Park, on the Great Falls of the Potomac. 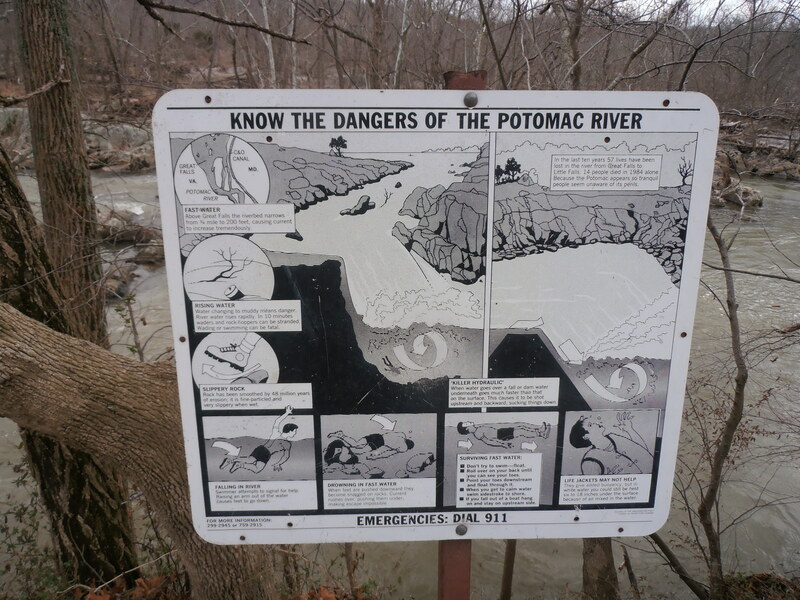 The Potomac River, as it drops 77 feet in less than a mile to sea level, is forced through the narrow and rocky Mather Gorge. The dramatic rush of the water can be seen easily because of well-placed walkways over the various parts of the falls. It’s possible, if the water isn’t over the walkways, to saunter clear to the widest part of the river, through interesting hardwood forests, full of moss-covered boulders. Welmoed told me the woods are full of wildflowers in the spring. We kept hoping to see the locally nesting eagles, too, but no such luck. We did see a lot of turkey vultures, which are plentiful in the park. 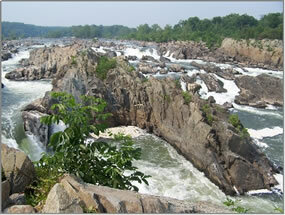 On the other side of the river you can see the rocky cliffs on the Virginia side rising out of the rushing water. 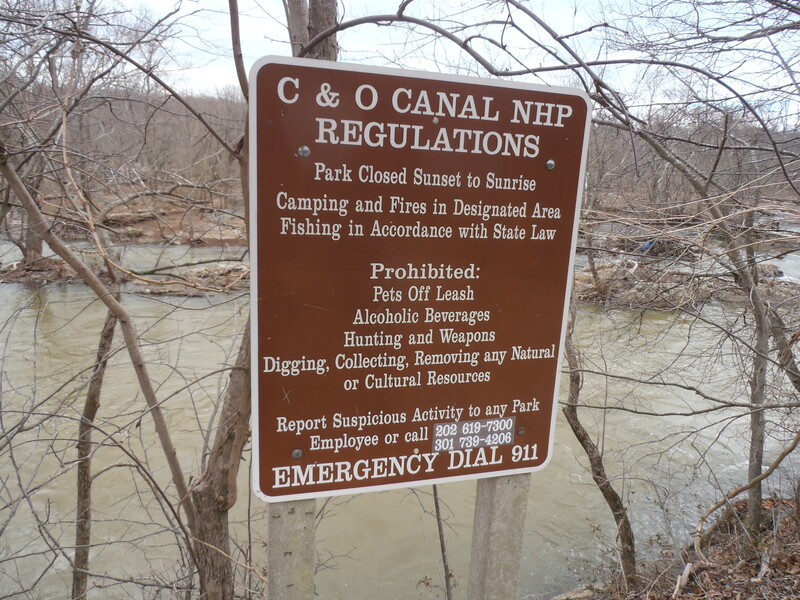 Seven people a year drown in the Potomac here, and while we were standing there two people on the Virginia side were inching their way down, illegally and foolishly. Alcohol may have been involved. 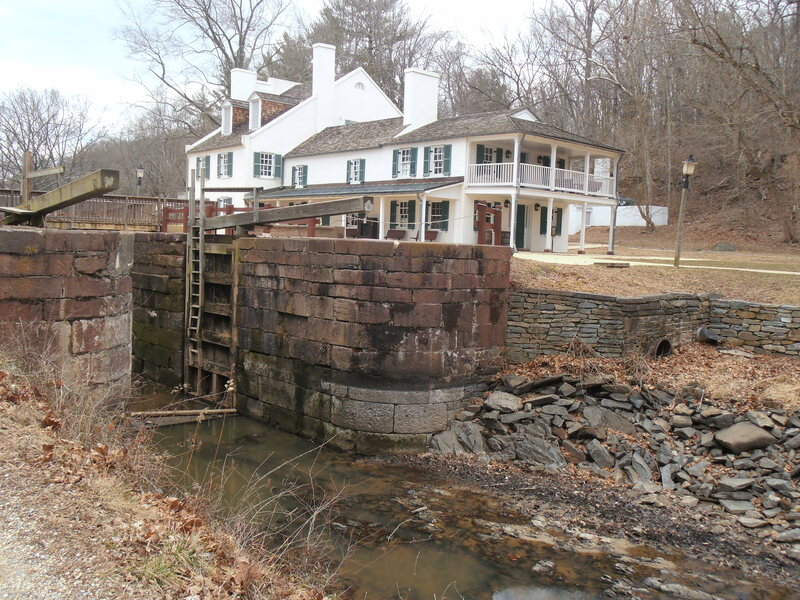 The other interesting feature about the park is the Patowmack Canal, which was once known as the “Great Falls Skirting Canal”. Back in the day, the only way to navigate the Potomac all the way to the sea would have been the canal and its lock system. The canal was begun in 1785, and it took seventeen difficult years to complete. Black powder blasting, little used before the formation of this canal, was utilized to forge a passageway through the solid rock. 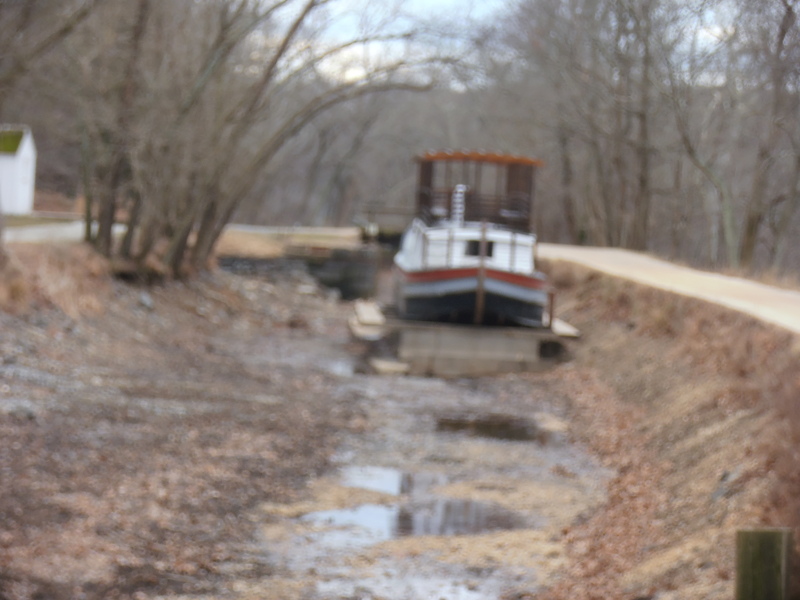 Today, part of the canal is visible, and the park maintains a boat of the type that would have traversed the canal long ago. There is also a wonderful visitors’ center with a museum of facts about the geography, history, geology, and flora and fauna of the park. Even though I was only in the area for a couple of days, I got to see and do quite a bit. Holly and I had dinner at several wonderful restaurants, and we made a quick trip to the National Portrait Gallery, which is part of the Smithsonian. Did you know that the Smithsonian Institute manages the world’s largest museum and research complex, with 19 museums, 9 research centers and more than 140 affiliate museums around the world? And admission is mostly free, except for the Cooper-Hewitt Museum in New York City (which is closed at the moment). The National Zoo is part of this complex, as well. 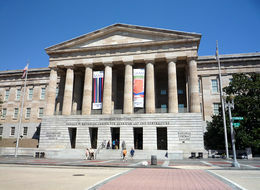 The National Portrait Gallery houses portraits of those who have shaped the United States into what it is today, from Presidents to poets, and in between. Next time I visit I’d like to see more of this museum. It’s huge, and we only got to see a small part of it. The woman at the desk told us, and I couldn’t verify this for sure, that all the artists represented in the museum were American. That’s pretty cool, if it’s true. Certainly, all the people portrayed in the paintings are or were American. My visit to Washington, DC was way too short, especially my time with Holly. But her conference experience was a success, and we had a fun time together. March 16, 2013. Uncategorized. Leave a comment. 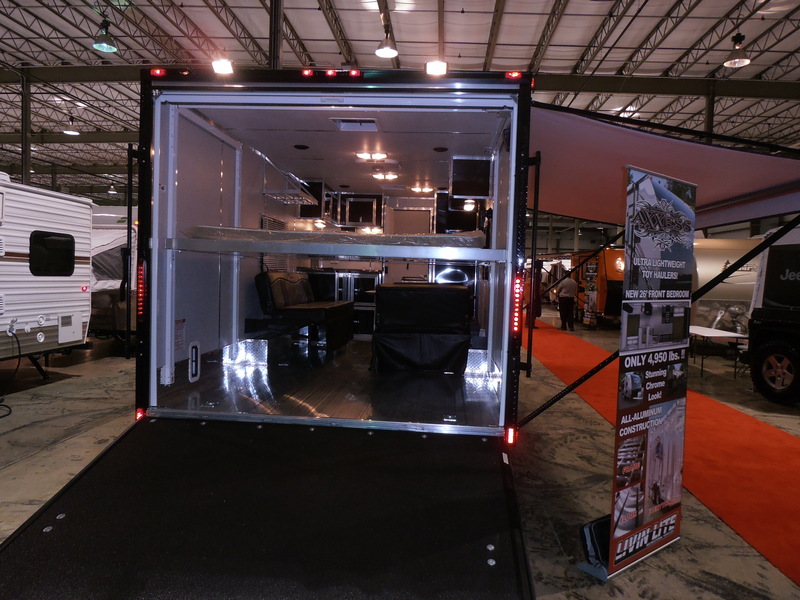 Last month, I picked up my mom, and together we went the Dayton/Cincinnati RV Show at the Dayton International Airport. I was hopeful that I could find the RV of my dreams. Well, maybe not. They had a hangar full of shiny new conveyances, some with their own means of power, and some meant to be hauled behind another vehicle (usually a truck). But it was fun to look at them. The trailer pictured in the photo above was small and light, but still too big to drag behind my Honda Civic. I would have to have a larger vehicle, and one with a trailer hitch. One other thing I realized about the trailers, even the small ones is that they cannot simply be unhitched when one wants to leave them at a campsite or other location. If you look at the back of the trailer you’ll see one of the stabilizers at each corner; these have to be set individually so the trailer doesn’t tip when you unhitch it. I imagine it would not work too well once you’re inside the thing if that’s not done, as well. Could be way too much funhouse for my taste! There are also some very cute, very small such trailers, which are basically an enclosed bed on wheels, with a camp kitchen on the back end. That’s just a bit too small for me. Somehow, I can’t see myself sleeping in that trailer, by myself. The potential for easy entry by an intruder seems far too great. There are some really cool, converted “toy haulers” that looked like an option. (Toy haulers are for hauling motorcycles, 4X4’s, go-carts, and other, well, toys.) But doesn’t this look a bit claustrophobic, with no windows? It’s shiny and pretty, but I can’t see this particular trailer as being very comfortable, especially in either the heat or the cold. So onward to more contained units, including the kind that propels itself. A friend who travels extensively in an RV with her husband recommended that I look at the kind they have, but I have not yet been able to see a Lazy Dazey RV in person. They are based on a van body, with the trailer wrapping over the top of the van cab, for additional room. 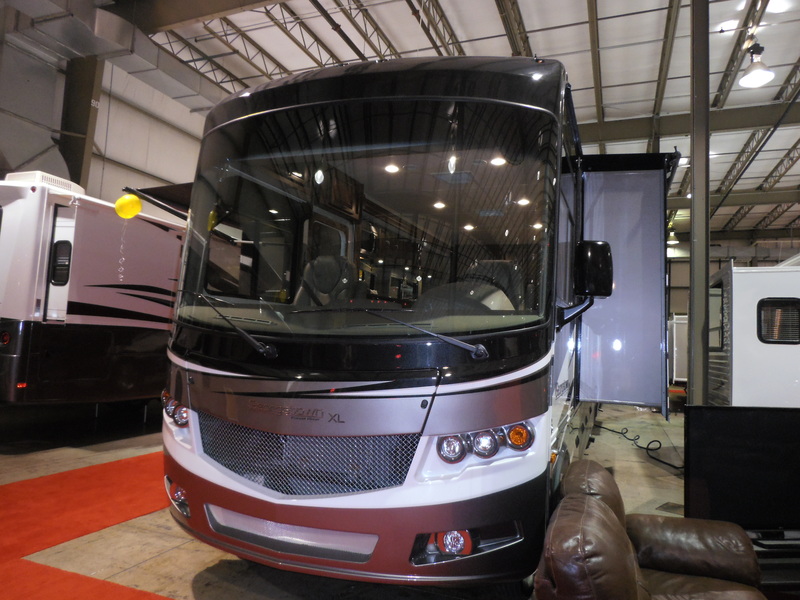 This was the closest thing I saw at the RV show. If I can’t find a Roadtrek somewhere, this type would be a nice option, although it’s still larger than I want, and taller, which would make it more difficult to park on a residential street. 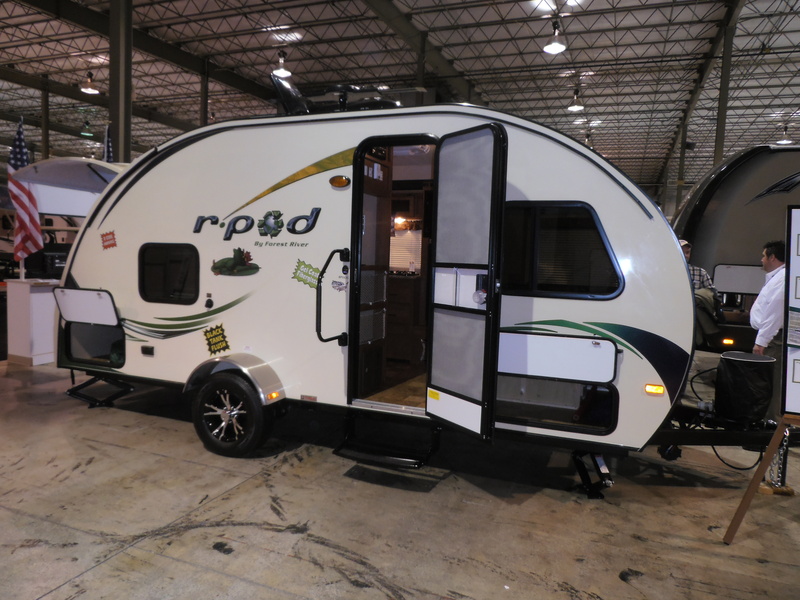 There are some nice features in this type of RV, though, including a roll-out awning for al fresco dining and relaxing. They have pretty big water tanks, too, and a generator for cooking, heating/AC, and for using TV, radio, and Internet. 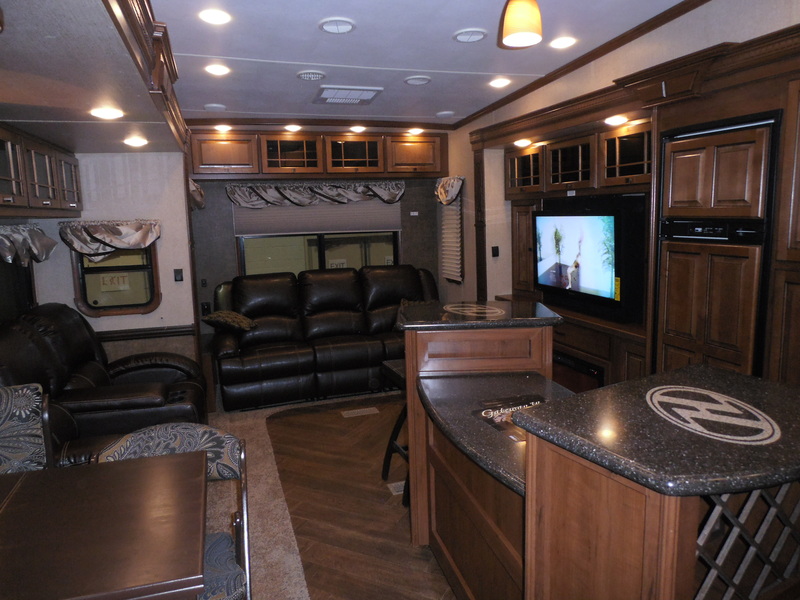 It is possible to find RV’s that are as large, or larger, than many actual homes. I’ve seen two-story motorhomes, with incredibly fancy interiors, with leather recliner/sofas, and giant flat-screen LCD TV’s, and gourmet kitchens with granite countertops. They are amazingly deluxe, but massive. It would be more like driving a bus than a passenger vehicle. 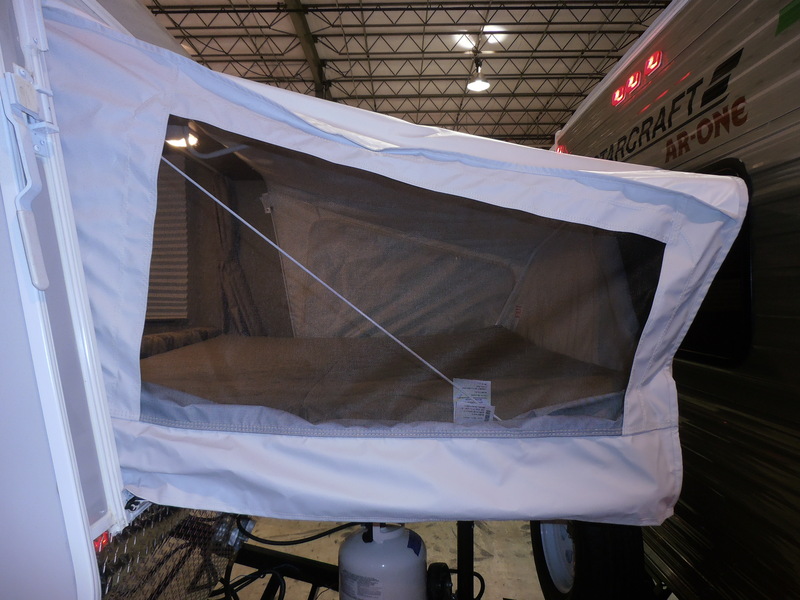 The side walls of the RV expand outward in order to provide so much room inside. It’s actually quite ingenious, all the different ways they use that feature to expand the interior. Entire kitchen walls or dining areas or seating areas slide into and out of the center aisles to create the illusion of vast space. It really would be possible to live in one of these. As long as you like the color brown. 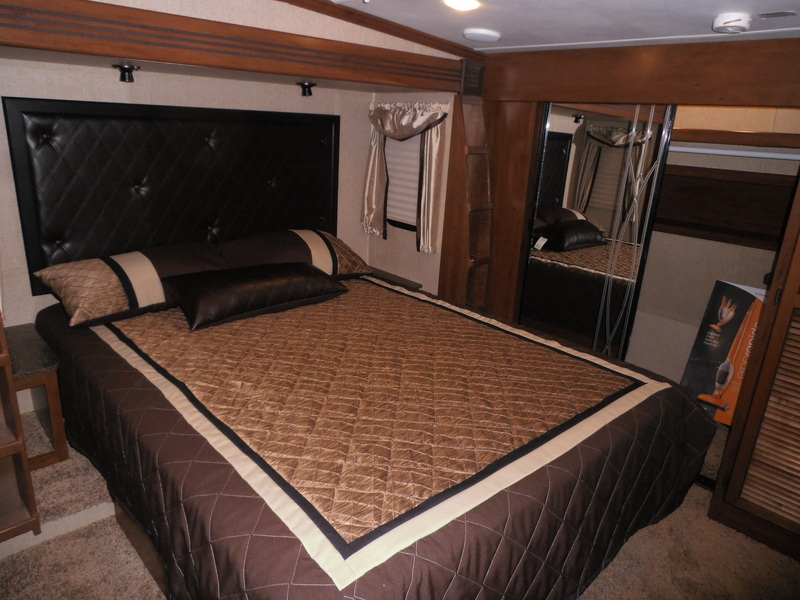 Every single RV or trailer I have seen so far has some version of a brown color scheme. I guess it is so dirt doesn’t show–I mean, who wants to have to work so hard to keep what is essentially a vacation vehicle clean? But still. It depresses me. Dark blue or dark green, or even burgundy would be just as nice, in my opinion. So the quest continues. But for the first leg of my journey, coming up soon, I’ll just be getting in the Civic and heading out. More to come! February 19, 2013. Uncategorized. 6 comments. See parts of the US that I’ve never seen before. Visit friends and family, including Internet friends who I’ve never met face-to-face. The ability to meander wherever I want, regardless of the availability of hotels, or other places to sleep. At the same time, I don’t want to spend a fortune–on lodging, gas, or food–to achieve these goals, and I would also like to be able to maintain a healthy lifestyle while on each part of the trip. How to manage this? Enter the small RV. Chevy makes a wonderful small recreational vehicle called a Roadtrek. 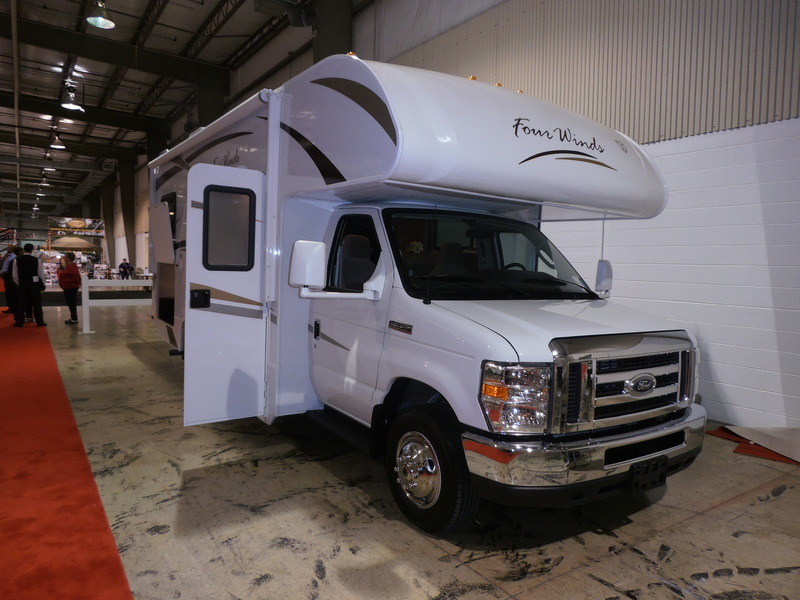 It is basically a conversion van, and includes a tiny but functional kitchen area, comparatively roomy living quarters, and one of the nicest RV bathroom facilities I’ve seen. I think the middle size, 19-feet long, will do just fine for my purposes. It’s just a foot or two longer than most vans, has a nice long wheelbase (for stability), is not so tall that crosswinds will make it unstable, and the gas mileage is not horrible. Also, because it’s a Chevy and has a gasoline motor, any issues that crop up along the journey can be fixed at most repair shops or dealers. I understand that diesel motorhomes can cause nightmares in the case of a breakdown. Truck stops usually have places to repair diesel engines, but I have heard of one person who was stuck at a truck stop waiting for a repair for nearly a week. Not my idea of fun. These vans include all the comforts of home: queen-sized bed, plus additional sleeping arrangements; air-conditioning and heating (propane tank); good-sized water tanks, both for fresh and dirty water; tiny refrigerator, two-burner propane stove, prep sink, and microwave; marine toilet, tiny sink, and both a handheld shower, plus an “in-aisle” drain with privacy door for a full-sized shower; Bluetooth; satellite radio; GPS; and built-in flatscreen TV. In addition, there is a dining table, full-sized mirror, and plenty of storage. What more could a girl need? My challenge now is to find one of these gems! For my first trip (of several, I hope), I’d like to rent one. This will allow me to test the waters, and to see if what I think the benefits actually are. January 18, 2013. Uncategorized. 5 comments. My name is Karen, and I’m getting ready to embark on a grand adventure. I hope you’ll join me, as I learn more about the United States, up close and personal. I’ve traveled to 49 of the 50 states, all except Alaska, but can’t say I’ve really experienced all of them. Ohio is my home, and I feel there is plenty I can still learn and enjoy about our 88 counties, let alone the rest of the country. A couple of years ago I was driving from my home in Cincinnati to Florida, straight down I-75, as usual. Typically, I would leave early in the morning of the first travel day and try to make it to somewhere south of Atlanta, spend the night, and then drive on. This time, though, I had stuff going on the night before and didn’t sleep well, so was unable to really get going until a bit late, and I decided to stop near Chattanooga to rest up for the rest of the drive. The next morning my daughter Robin called, and I told her where I was. She said “Mom! 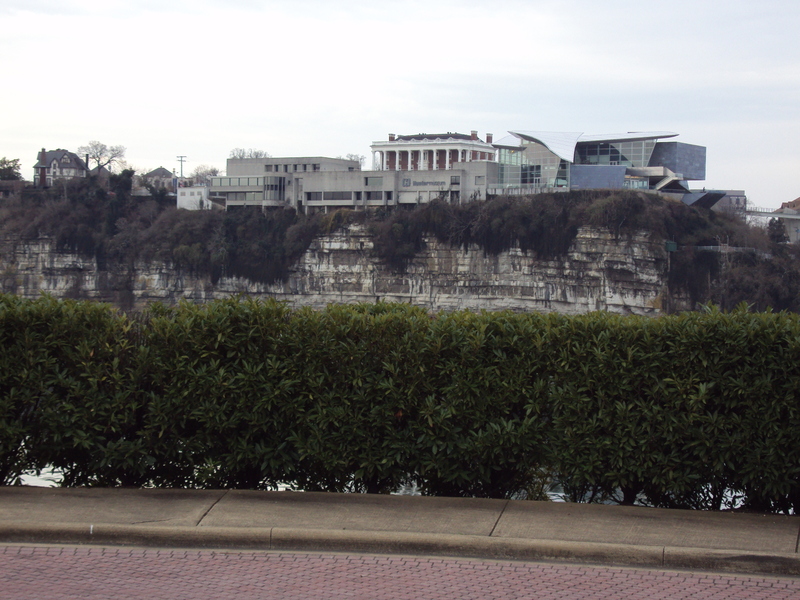 Chattanooga is one of my very favorite cities! You really should go into town and check it out.” After I checked out of the motel I used Robin’s directions to find the row of museums along the river bluff (not yet open, that early in the day), and then to cross the Tennessee River over to the North Shore, an area along the riverfront with shops and restaurants and bars. How could I have driven up and down I-75 for more than 40 years without once stopping in such a great place? I’m ashamed of myself, for having missed this, and so many other, amazing places. That trip was a revelation. I spent the rest of the time traveling a bit sideways to the beaten path, and began the first tentative steps to the odyssey on which I now am planning to embark, to expand on the idea of that first trip, and to travel the width and breadth of the US. I am fortunate to have lots of family and friends flung all over the country, and I plan to visit some of them (and you) on this voyage of discovery. This blog will serve as my diary, first for planning the means and the path, and then to the journey itself. My motto: You learn something new every day–if you pay attention! January 14, 2013. Tags: Welcome. Uncategorized. 29 comments.